I hate getting on planes. I’m going to be brave today, by getting on that plane. 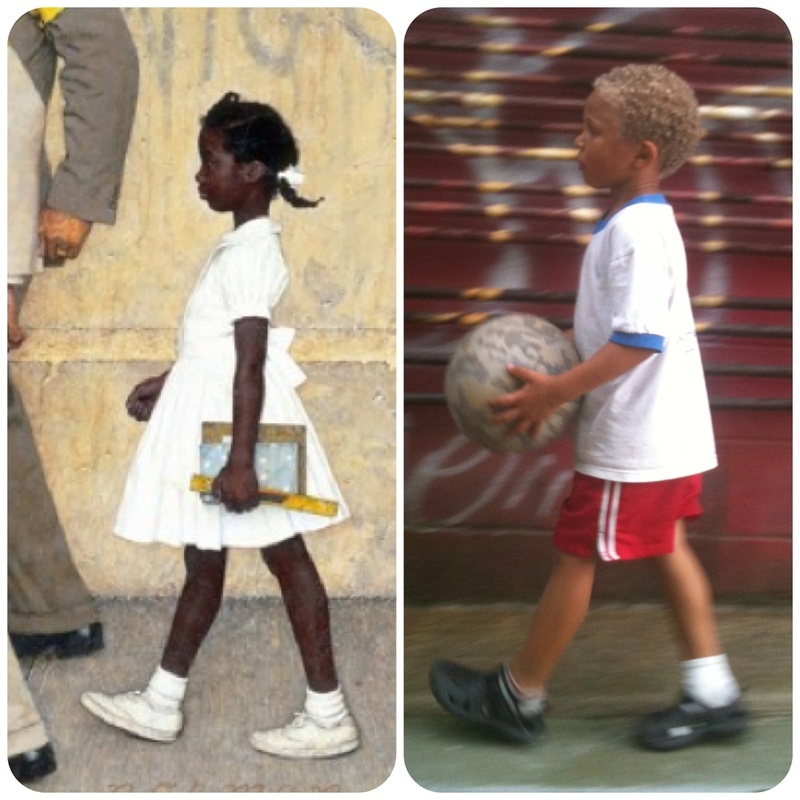 This made me think about the picture (above) that I took earlier this week of Marcel superimposed next to the famous Rockwell of Ruby Bridges. I explained to him how brave she was over fifty years ago, to go into a school where she was the first brown skin student “invited” to study. (I framed it in terms of how brown skin kids did not have the same choices about where to go to school as creamy colored kids did. ) So today in honor of Memorial Day, and our trip in a few hours to Washington, DC, the Martin Luther King Memorial, the Lincoln Memorial, the Air and Space and our walk by President Obama’s house.. I thought I’d ask my family, and you what it means to you to be brave today. Marcel: Going to a new school, and doing new things. I’m going to be brave by going to a new school next year. Sam: Making new friends. They are hard to pick because you just met them, and you don’t know if they are going to be a good friend or not. A good friend is one who involves me in stuff. Me: It is brave to keep seeing the container I have worked so hard to make to hold my family and me safely in the world is just not the right size anymore. I got damn comfortable, and “good at” being Mama C and the Boys in practice and theory. My entire identity in the last eight years has been built around doing this as a single mother. But, here I am looking at a table of four getting ready to go on a trip together to meet the extended family. We are sipping coffee, laughing, and writing a blog post together. What could possibly be brave about that? OK dear readers how are you being brave today? What is it to be brave? Last week a new blogger I recently came across pushed “publish” on a post that was really hard to put out there. She took a huge risk. Yesterday one of Sam’s team mates who has had a really hard time getting a hit, came up to bat again. He nailed it. How brave is that? Thank you to my new subscribers this week! It is always a thrill to get that little email saying someone new has signed up to get the blog personally delivered to their email. I love that Ruby Bridges painting by Norman Rockwell. We are bringing her back to visit at my elementary school. Did you know that she does school visits? She is truly living history! She does? That is SOOOO cool. I love that. I’ll share that knowledge! Today I bravely sat in my mothers hospital room and talked to all her doctors. Today I moved past my fear of loosing her and embraced the day we had and the days to come. Today I bravely invited an attorney to visit my home in a few days so that he can testify at the Colorado Supreme Court next week and hopefully bring an end to the 18 month battle for my son’s permenancy- I bravely (not so patiently) wait for his adoption to be finalized. Today I bravely and proudly spoke about my multiracial family and educated another about love and racisim. Thank You Mama C- have fun on your trip!! No, thank you for sharing the bravery in posting all of this, and sharing it here. How did you find the resources within for ALL of this? Sending you ease Mama! Ease. As single Mama’s we learn fast how to cope with all of the unknown’s. I am a single Mama of three special needs children 3 and under and everyday I find more strength, but is knowing that I am not alone (Mama C, Brown Babies/ Pink parents and Chocolate hair Vanilla Care) help me realize that the journey we are all taking isn’t really alone. Send some good energy this way, Thursday is court and I wil hopefully know if/when my son can be adopted!! Thanks for all your inspriation! Oh, you are all SO brave – to be choosing to open your hearts to the risk of more love. Blessings on all of you! My brave act this weekend was to choose to spend three days at Maine’s Democratic convention, to notice how uncomfortable I get when there’s conflict (my husband’s on the staff of a political campaign), to choose to breathe, relax and realize that it’s all fine. Oh indeed that was your BRAVE Annie! I am impressed with all of that BREATHING and expanding indeed!